If you didn’t read A Wrinkle in Time when you were a kid, you and I need to have a serious discussion. We’re not talking about just time travel, we’re talking off-planet travel AND time travel! A simple child’s mix of particle physics, Einstein, relativity, and good vs. evil, A Wrinkle in Time was formed from questions and discoveries of science and a life in the cold war of the 1960’s and took us to places not many girls dared to travel. If the term “drama queen” had been common place in the mid 1960’s, Meg Murray might have been labeled a drama queen. She doesn’t think she’s smart, she doesn’t think she’s pretty, and she walks around with a big chip on her shoulder just daring someone to knock it off. I suppose in some ways, she has a right to be sullen and somewhat resentful, though. Her father left for a top-secret job and never returned. Her mother is a brilliant scientist who is absorbed in her work and with dealing with town gossips talking about the husband that abandoned her. Meg’s middle brothers are fairly well adjusted and don’t understand why Meg can’t just conform. And Meg’s younger brother, Charles Wallace, is small for his age, extremely intelligent, and doesn’t speak in front of strangers which makes him the perfect target for bullying. This sets the stage for a story that captured the imaginations of children and adults everywhere. The first of a planned trilogy, which eventually became a tetralogy (often referred to as The Time Quartet), author Madeleine L’Engle told a story of a young girl in flux. An adolescent, pre-teen, who is learning the hard way that people can be mean and not so understanding when you feel as though the world is crashing down upon you. But, in the middle of all this misery, she learns how important her family is and she also discovers that love can be found in the most unexpected places. The book, which blended adult themes, science fiction, and fantasy, went on to win numerous awards including a Newbery Award Medal, a Lewis Carroll Shelf Award, and it was a runner-up for the Hans Christian Anderson Award. 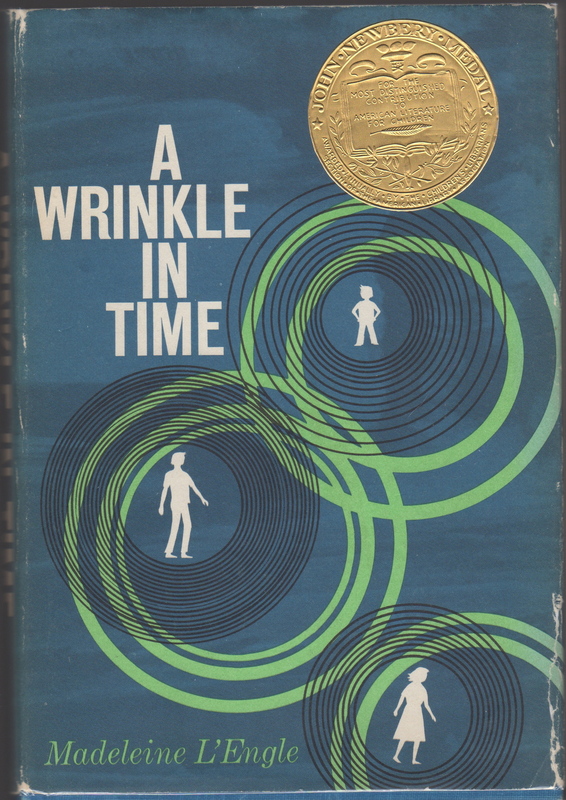 A Wrinkle in Time has been in continuous publication since it was first published in 1962. I first read this book when I was in the fourth grade and still have my original paperback copy. While I was in my 20’s, I purchased a new set of the collection (in paperback) and then a few years ago, I purchased a hardcover copy of The Time Quintet. About a year ago, I came across a copy of the first edition (pictured) in its 31st printing. It had the original dust jacket and was inscribed by Ms. L’Engle herself. Her inscribed books are selling on the market starting at $100.00 all the way up to $20,350.00 for a 1st edition/1st printing in fine condition. January 27, 2012 marked the 50th anniversary of A Wrinkle in Time. A Wrinkle in Time: 50th Anniversary Commemorative Edition is available now on Amazon. Just click the link or the picture below to go straight to Amazon’s page to purchase this commemorative edition. According to Amazon’s website, this redesigned edition includes “an introduction by Katherine Paterson, an afterword by Madeleine L’Engle’s granddaughter Charlotte Jones Voiklis that includes photographs and memorabilia, the author’s Newbery Medal acceptance speech, and other bonus materials. For more information on Madeleine L’Engle and ALL the books she’s written (including the rest of the Time Series), go to her website at www.madeleinelengle.com and Happy Tessering, everyone!